The “Correction” that was issued by “conservative” Catholics a few weeks ago seems like such old news now, doesn’t it? 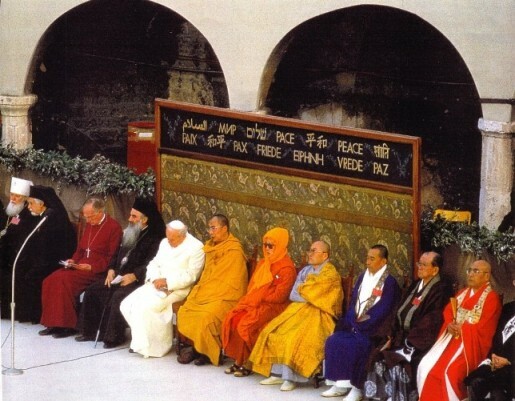 Jorge Mario Bergoglio is simply a more vulgar, easily understood propagator of the lies of conciliarism than was his immediate predecessor, who used Caritas in Veritate, June 29, 2009, to call for a global system of financial governance (see Where Does One Begin? part two.) Anyone, however, who thinks that there are major substantive differences between the two are very, very mistaken. To denounce error is not to "pile on" those who propagate it. Each of our true popes and Holy Mother Church's true general councils had to be wrong to denounce error and to insist on doctrinal formation in catechesis and missionary work for Jorge Mario Bergoglio to be correct. This simply cannot be so. Moreover, Pope Pius IX’s Qui Pluribus reminds us yet again that Holy Mother Church “has always preserved entire and unharmed the faith entrusted to by to by Christ the Lord,” meaning that it is impossible for heresies to be taught by a true pope in the name of the Catholic Church. Where were the authors of the “Correction” when Bergoglio issued Evangelii Gaudium? Is God any less offended by the Argentine Apostate’s false dichotomy between doctrine and mercy in Evangelii Gaudium (and in his daily screeds at the Casa Santa Marta as he conducts his Ding Dong School of Apostasy) than by the application of that dichotomy in Amoris Laetitia? This one passage shows that the authors of the “Correction” are seeking to defend Faith and Morals against a false claimant to the Papal Throne and in a false religious entity that is not and can never be the Catholic Church. The “Correction” is in need of a correction concerning the spotless nature of the Catholic Church. Well, authors of the “Correction,” is the Mosaic Covenant still valid? Below, "Pope Francis" hides his pectoral cross in front of the ancient enemies of Our Blessed Lord and Saviour Jesus Christ, May 27, 2014. 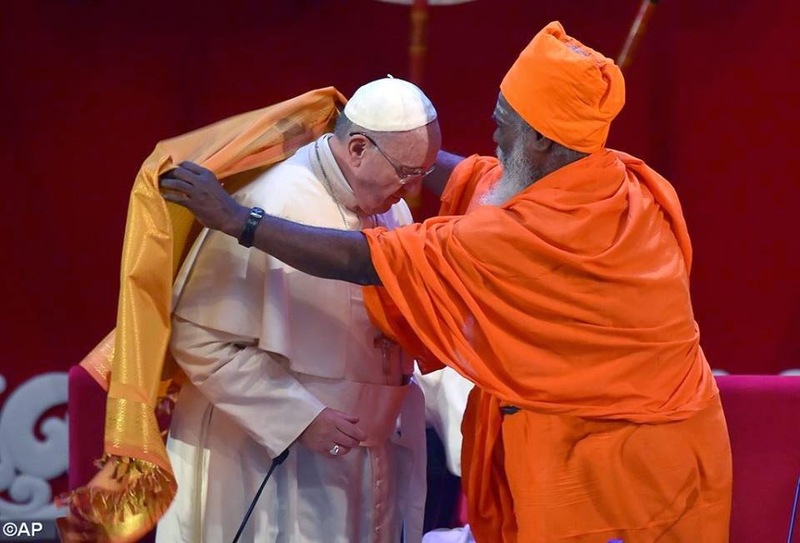 As the post on Call Me Jorge on which the photographs above may be found, noted, Bergoglio also paid an impromptu visit to a Buddhist temple on the way back from a Marian shrine in Sri Lanka. So much idolatry, so little time. 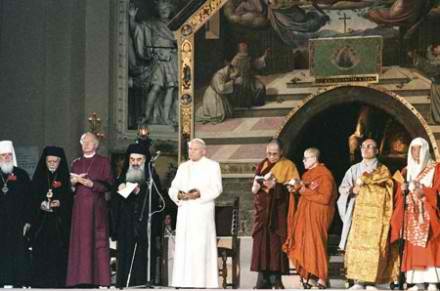 The leaders of "other religions," including those who worship the "Great Thumb" and those who worship their ancestors and Asiatic cults of the devil (Hinduism, Buddhism, Jainism, Shintoism--which is a made-up religion in Japan to exalt that country's nationalistic myths), are simply unreconstructed pagans. No one, no, including the authors of the recent “Correction,” has dared to “correct” the false “pontiff” for his failing to keep the Ten Commandmetns inviolate. No “conservative” Catholic, including Raymond Leo “Cardinal” Burke, will ever do so because each accepts most of conciliarism’s false premises (false ecumenism, the new ecclesiology, the "new Mass," episcopal collegiality, the separation of Church and State, religious liberty, "natural family planning" and the inversion of the ends of marriage as well as undermining the innocent and purity of the young by means of explicit classroom instruction in matters of holy purity, etc). No one is "innocent" within the confines of the counterfeit church of concilarism. As is the case in the secular world, the difference between the false opposites within the counterfeit church of conciliarism is only a matter of degree, not of substance about the basic fact that the conciliar church and its premises are false, offensive to God and thus harmful to the temporal and eternal good of men. Each is, to a greater or lesser extent, a true son of Martin Luther. True, the authors of the “Correction believe that they are "holding the line” against a renegade “pope,” but this belief is a deception that is the result of their refusal to face the simple fact that their entire life's work in support of the "Second" Vatican Council and the "magisterium" of the conciliar "popes" up to the time of Bergoglio has been a lie. A careful reading of these sentences will reveal the exact modus operandi that Jorge Mario Bergoglio has used at the Casa Santa Marta to bludgeon and belittle anyone who dares to question his revolutionary agenda that is merely bringing conciliarism to its logical conclusion. Although the apologists of the schismatic "resist while recognize" movement keep making caricatures of themselves by engaging in the same kind of minimism that was condemned by Monsignor Joseph Clifford Fenton sixty years ago now in his treatise on the binding authority of papal allocutions, the fact remains that, despite their best efforts to refuse to admit the reality that is plainly before their eyes, The Chair is Still Empty. We must persevere in our steadfast rejection of everything to do with the false church of conciliarism, whose lords seek to lull traditionally-minded Catholics to sleep in any number of ways, contenting them with a modernized version of the Immemorial Mass of Tradition offered mostly by non-priests in Novus Ordo temples in order that these Catholics will refuse to rise to the defense of the honor and glory of the Most Blessed Trinity and the Holy Faith as they are attacked unremittingly by the merchants of the new world order in the counterfeit church of conciliarism, starting with a man who himself rarely mentions Our Lady's Most Holy Rosary, Jorge Mario Bergolio. We must remain steadfast in our own efforts against sin in our lives, forgiving others as we are forgiven in the Sacred Tribunal of Penance, being earnest about making reparation for our sins and those of the whole world as the consecrated slaves of Our Lord through His Most Blessed Mother's Sorrowful and Immaculate Heart, considering it our privilege to be insulted and calumniated and subjected to detraction from others prior to the just Judgment of God that will be rendered on our souls at the moment of our deaths and that will be revealed for one and all to see on the Last Day at the General Judgment of the Living and the Dead. Yes, we who caused Our Lord to suffer unspeakable horrors in His Sacred Humanity during His Passion and Death and who wound His Mystical Body today, we who have thrust those Seven Swords of Sorrow through His Most Blessed Mother's Immaculate Heart, we--each of us--must be willing to suffer and to suffer well everything that happens to us as the means to glorify God and to make reparation for our own sins and those of the whole world as the slaves of the Immaculate Heart of Mary. We are dealing with forces at present that are preternatural. We are not going to "will" ourselves out of the apostasies of the moment. While a given article here and there might help one or two souls now and again, we have to recognize that any and all efforts, whether spoken or written, to combat the apostasies of the day, will come to nothing if they are not undergirded by the rock solid foundation of assisting at the daily offering of the Immemorial Mass of Tradition, offered by priests who make no concessions to conciliarism or to its false shepherds, profound Eucharistic piety, and deep, tender devotion to the Mother of God by means of Total Consecration to her Sorrowful and Immaculate Heart and by the reverent praying of as many Rosaries each day as our states-in-life permit. .
We must, however, be people,unlike many of the conciliar revolutionaries, who are on fire for our love of the Rosary, which Our Lady stressed in Fatima is a principal means after Holy Mass itself to save our own souls and to help to convert other poor sinners and thus to save them from the fires of Hell that she had shown to Jacinta, Francisco and Lucia on July 13, 1917. Our Lady told Francisco that he would have to pray many Rosaries to get to Heaven. Francisco Marto, mind you! And we must convince more and more of our friends and acquaintances to pray the Rosary. Our Lady wants this. So does her Divine Son. You see, the practice of praying the Rosary was lost between the time of the Fourteenth and the Fifteenth Centuries. Our Lady gave the Rosary to Saint Dominic, who used it to crush the Albigenses heresy. She told Father Alan de la Roche to re-establish the Confraternity of the Holy Rosary in the year 1460, just 101 years before the Battle of Lepanto. We are in a figurative Battle of Lepanto at present, dealing with preternatural forces that appear to vastly outnumber those who have chosen, despite their own sins and failings, to remain faithful to the authentic patrimony of the Catholic Church and have rejected such abominations as the Protestant and Judeo-Masonic Novus Ordo liturgical service and the "luminous mysteries" (how do the 150 Psalms fit into the number 200?) and the new ecclesiology and ecumenism and religious liberty and separation of Church and State. Many of those who have come to see the truth of the state of the Church Militant in this time of apostasy and betrayal are hated by their own former friends and colleagues and, in all too many instances, by many of members of our own families. None of this matters if we care to unite ourselves to the Mercies of the Most Sacred Heart of Jesus through Our Lady's Most Holy Rosary, giving each Rosary we pray to the Sacred Heart through the Immaculate Heart of Mary as her consecrated slaves. We need only be faithful to the practice of the daily praying of the Most Holy Rosary. Our Lady will bring about results that we may not see until eternity, please God we persist until our dying breaths in states of Sanctifying Grace. Everyone--and I mean everyone--has time to pray at least one set of the mysteries of Our Lady's Most Holy Rosary each and every day without fail. It is the devil who wants us to make a million excuses as to why we can't find time to pray the Rosary on a daily basis, no less to speak about with love publicly and to invite all others to join you in its prayer recitation. Although we should note with sadness the ceaseless (and ceaselessly clumsy and transparent) efforts of the conciliar revolutionaries to deconstruct Our Lady's Fatima Message and to defend the new world order, we must never be discouraged or disconsolate. Never. We are Catholics, not brooding or sappy sentimentalists. The final victory belongs to the Immaculate Heart of Mary. We can plant the seeds for this victory by our daily fidelity to Our Lady's Most Holy Rosary. What better time to be devoted anew to the true Fatima Message of the true religion than this month of October, the month of the Holy Rosary and of the Holy Angels?